The Ancient Egyptians believed that statues were a living embodiment of the gods - including statues of Pharaohs who were seen as living gods. The familiar 'sitting position' of many of the great statues was believed to allow the living soul (the Ba) to stand erect and "go out into the day." The Statues of the Gods found in temples were made of the finest and most expensive materials including gold and ebony. Statues of the Gods and Goddesses were believed to be living embodiments of the deities by the people of Ancient Egypt. These sacred statues of the gods were generally housed in the Temple dedicated to the god. The temples were seen as the dwelling place of the god and the statues the embodiment of the god. These sacred statues were worshipped and revered. Prayers were offered to these statues of the gods together with physical items such as food and drink. The statues were washed, oiled and adorned with make-up, jewelry and clothes. The High Priest would conduct ceremonies and offer prayers and incantations to the statues but there was another important priest, called the Medjty, who was responsible for the toiletries of the statues. The statues would have been washed and oiled then dressed in fine linen. Eye make-up, powder and rouge was then applied and sacred oil rubbed on the forehead of the statue. The statues were only seen by ordinary Egyptians at important festivals when the effigy was paraded in magnificent processions. Gypsum - Gypsum is a common white or colorless mineral (hydrated calcium sulphate) used to make plasters. Plaster of Paris is burnt gypsum. Alabaster is one of the forms of gypsum. The Ancient Egyptians built the enormous statues with limited tools and equipment. Egyptian sculptors first used only flint tools, then tools made of copper and with time bronze and iron. Statues made of hard stone such as granite, gneiss, basalt and graywacke were highly polished. Statues made of softer stones such as sandstone or limestone were painted in a whole variety of different colors. The stone surfaces of statues were covered with a form of plaster on which designs were drawn and colored. The eyes and jewelry depicted in the hard stone statues were also painted. A sandstone or limestone statue would have been deemed imperfect if left to show the colour of the stone in which it was cut, and was painted from head to foot. In bas-relief, the background was left untouched and only the figures of the statues were coloured. The ancient Egyptian believed that these statues contained the spirit of a person. When a Pharaoh, such as the heretic Pharaoh Akhenaten, was so hated, the Egyptians might have destroyed or defiled his statues. The nose of the statue were smashed making it impossible for the figure to breathe, thereby killing it. Eyes, ears, and mouths may also have been defaced to destroy the main senses. 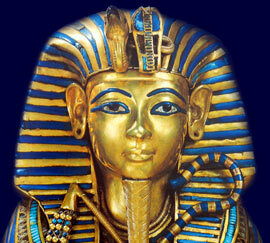 Most Ancient Egyptians had small shrines and statues to gods in their homes. Particularly popular would have been a statue to Bes for protection against evil. These small statues would have been made of wood such as Acacia and Sycamore or of gold or other precious metals or ebony in the homes of the wealthy. Wooden statues would have been covered with plaster and then painted and decorated in various colors.